Holidays are usually steeped in tradition and a huge favorite holiday of mine, Halloween, is just around the corner. As such I’d like to share some thoughts on what has become my own little comic book Halloween tradition, picking up the release of the year’s special The Simpson’s Treehouse of Horror issue from Bongo Comics. It’s incredible to think that this issue marks the 16th year that TOH has been published. My fascination with the regular monthly Simpson’s comic (which first appeared in late 1993) pattered out over 10 years ago. Though very well written and illustrated, the sense of comedic timing so essential to the success of the show just does not translate in most instances to the comic page. This is, however, not a problem with TOH as these stories are often direct parodies of horror and sci-fi comics themselves and always employ top-notch talents from both the mainstream and alternative press. Under a great painted Mars Attacks! themed cover, things start off in grand fashion as Milk & Cheese creator Evan Dorkin gives us a story of the tight briefs wearing, Kirby-esque cosmic monstrosity The Glavin invades Springfield and, with much glee, proceeds to turn everyone to pulp. I love the little detail of Ralph Wiggum munching on some of those weird, indefinable cosmic dot patterns so familiar to Kirby fans (“The dots burn when you lick them!” he remarks) only to puke them back up. Drawn in the very familiar Simpsons cartoony fashion, it’s a little freakish to see so many favorite characters dispatched in such a gore-soaked fashion. It occurred to me after reading this story that the bigger joke here is also the most subtle. If you go back and look at the 1950’s & 60’s Marvel titles (like Where Creatures Roam and Where Monsters Dwell) it’s astonishing how little those creatures, of whom The Glavin is clearly a parody of, hurt the horrified populace. Next up is a revenge tale, The Coff-Diddly-Offin, written by Kelvin Mao with great moody art by Batman: Red Rain artist Kelly Jones. When Ned Flanders’ standard exorcism of his son Todd goes awry because of Homer, Ned decides to teach him a lesson once and for all via a coffin turned “food stuffer.” Again we see some things even the cartoon probably wouldn’t touch, like a drunk driving Homer running over Flanders in his own driveway. In keeping with the Mars Attacks! 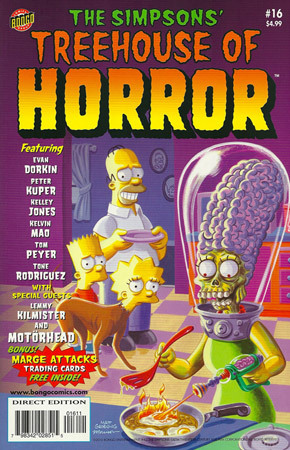 theme of the cover we actually get 4 Marge Attacks! cards in the center of the comic featuring scenarios that will be familiar to any fan of the amazing, Norm Saunders illustrated, original card set. Peter Kuper is an alternative comic creator famous for his meticulous, often politically charged stenciled art. Here he gets fast and loose with his take on the Poe classic The Tell-Tale Heart, now renamed Tell-Tale Bart. Wrapping things up nicely is Homer Goes To Hell with art by Tone Rodriquez and script Lemmy Kilmister (!) and Tom Peyer. Here, we have Homer sent to the inferno of Hell courtesy of Satan and Motorhead themselves. Having rock stars appear in and contribute to the TOH comics is becoming a tradition in itself with Gene Simmons, Rob Zombie, and Alice Cooper starring in past issues. This, the 16th issue of The Simpsons’ Treehouse of Horror, is the strongest in several years and if you’ve never picked one up before I highly recommend you do so and sget that spooky and ooky vibe on early this year. Halloween is only a month away folks, make sure your comics in October are more treats than tricks!